Strawberries are definitely, hands down, my favorite fruit. As a child of the 80's, I loved the Strawberry Shortcake character. One my favorite pastimes as a child was going strawberry picking with my family (though it always resulted in spending countless hours in the kitchen cleaning and cutting strawberries for freezing--not so much fun). If there is a pile of hard candy or lolly pops, I will always fish out the strawberry flavored ones. I even love strawberry printed fabrics and strawberry adorned clothing. So, when it is strawberry season, I tend to go a little overboard with the strawberry themed foods. I hope you don't mind. Here is a recipe for a strawberry lemon shortcake that I've been making for many years. Enjoy! Preheat oven to 425 degrees. In a mixer, combine the dry ingredients and lemon zest. Cut the butter into one 1/2 cubes and add to dry ingredients. Mix until the dough is course and the butter is cut into pea size crumbles. Add the milk and mix until dough is moist. Turn dough out onto lightly floured surface and knead 2 or 3 times, until dough is holding together. 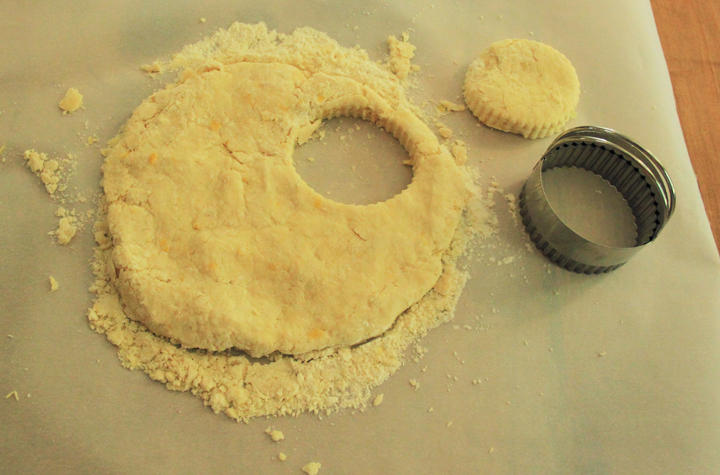 Pat into a 3/4 inch round and using a circular cutter, cut 3 to 4 inch rounds out of the dough. Place on a cookie sheet, brush with milk and sprinkle with sugar. Bake on the middle rack for 15 minutes. Slice 2 pints of strawberries and place into a bowl. Add 1/2 cup of sugar and stir. Place in refrigerator overnight or for at least 2-3 hours. In a mixer, combine 16 oz of heavy whipping cream with 1 tsp vanilla and 2 tbsp sugar. Use the whisk attachment and put mixer on medium speed until the cream starts to hold shape. Be careful not over mix or it will turn into butter.